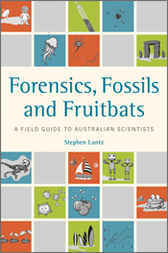 Forensics, Fossils and Fruitbats is a fascinating collection of more than 70 profiles of Australian scientists from 15 fields of physical, biological and medical science. These scientists have been selected because their research is inspiring, intriguing or simply quirky, or because they have taken an unusual or interesting path to the work they do.Scientists at all stages of their careers are included, from PhD students through to some who have long retired. Readers will meet scientists who have been honoured as the elite of their fields, as well as many who contribute in the shadows.Profiles include: a forensic archaeologist whose work has taken her from Antarctica to Pompeii; palaeontologists who revolutionised understanding of Australia’s dinosaurs; the founder of an independent rainforest research centre with a speciality in flying foxes; a computer scientist teaching computers to understand jokes; and the engineer behind technologies that could bring clear sight to a billion people and clean energy to billions more.For anyone considering a career in science, Forensics, Fossils and Fruitbats provides insight into the challenges and triumphs of being a scientist. For everyone else, it is a rare peek into the reality of how science is done.